In Persian we have a phrase, whose translation would be "in the bed of disease". It means when you are ill and resting in bed. Can we use the same in English? What are equivalent phrases? The term in English is sick-bed or sickbed. She lay in her sickbed, wracked by fever. One of the duties of a pastor is to visit the sick-bed. To be bedridden is having to be in bed because you are ill or injured. For example, Jason was bedridden for a year after the accident. Indeed, sickbed was a very common term in litterature especially around the times of Jane Austen, because people stayed at home in bed when they were ill, andoften in stories of kings the king lies on his sickbed/deathbed, historical famous scenes are often located at the deathbed and at the sickbed of a father or child. Rather than using Latin to find new words for English, we normally add old words together, so we get riverbed, seedbed, flowerbed, hotbed, bedrobe, bedbug, bedroom. There's an expression which sais: good night, sleep tight, don't let the bedbugs bite, for children. The concatenations are possible because of the stress-timed intonation, same as arabic and italian but different from french which is rythmic, and because of the soft consonants of R and W and GH in english which makes longer complex syllables which have less percussion sounds and more ambigious and transitional, i.e. compare latin percussive rythmic words like "conviviality" "sonically" "écouter" with english soft words like "humerous" "heard" "sound". the complex syllables means we can use less syllables than some other languages, because the syllables have varied sounds. Using "[noun] of [modifier]" in English sounds poetic or theatrical to me - something that you might say to dramatically emphasize a point, more than something you'd use in normal speech. The more common ordering in day-to-day speech would be "[modifier] [noun]"; e.g., "sick-bed" (as other answers suggest), "winter flower", and so on. 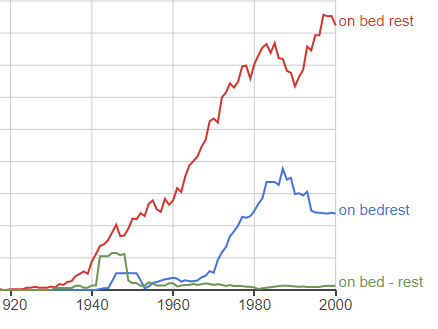 With "bed of disease", there's also an ambiguity: "bed" can mean a place where something lives/grows, so without context I would find it hard to tell whether you mean "a place to rest from disease" or "a place where disease lives (or spreads from)". Yes, you can say "the bed of disease" but it sounds archaic. We cannot tell how soon we may be laid prostrate on the bed of disease and of death. Who would not wish to avoid that pain, which is reflected, for days, and weeks, and months, and years, from the faces of those we love, who watch, and weep, about the bed of disease and death ! Not the answer you're looking for? Browse other questions tagged phrase-request or ask your own question. How to say somebody has a higher probability to catch a disease/get sick? Can we say “success podium”? What do you call or how do you describe this in English? overcooking the food? What do you call the black stuff?